For some reason Brașov and Sibiu have always been competing for who is better, which city looks nicer, which is older, which has the best kept traditions and the coolest people. Since moving in Sibiu, I lived under the impression that Sibiu is actually the coolest. And that is maybe because I never took the chance to visit Brașov as a tourist. So finally here we are. We took the time to explore a bit of Brașov, like any other tourist would. A bit o research on the internet, a list with all the attractions, a map, a brand new photo camera and almost a full day of walking around. We started in the morning with a walk on the Republic Street, which is a pedestrian area, with restaurants, old buildings and shops. From there you get directly in The Council Square, which is surrounded by historical buildings. The Council Square is today the main meeting point of the city and was in the past used as a market and fairs place. In the middle of the Council Square, you will find The Council House. The Council House is an important historic monument which is impressive by its very architecture. Initially, the Council Hall was used as a surveillance tower. The building has suffered many modifications during time, some due to fires, earthquakes or lightning. Between 1909-1910 the last modifications of the building were made when the roof was changed to the current Baroque pyramidal roof with colored tiles. Starting with 1950 the Council Hall has been hosted the County History Museum. Here is a panoramic view over the Council Square and the Council House taken from the Tampa Mountain. Another important attraction of Brașov is The Black Church. It was built by the German community of the city and stands as the main Gothic style monument in the country, as well as being the largest and one of the most important Lutheran (Evangelical Church of Augustan Confession in Romania) places of worship in the region. The structure was partially destroyed during a great fire set by invading Habsburg forces on the April 21, 1689 (during the Great Turkish War).Afterwards, it became known as the Black Church. A large part of the inner structure was modified during the 18th century, breaking with the original design. The Black Church is 89 meters in length and 38 meters wide. It measures 65 meters from the floor level to the highest point of its only bell tower. The Black Church has a six ton bell, the biggest in Romania, an impressive 4,000 pipe organ built in 1839 by Carl August Buchholz (1796–1884) which is played during weekly concerts, as well as a rich collection of Anatolian carpets donated from the 15th to 17th centuries by Transylvanian Saxon merchants, some of which are said to have been used to decorate walls as well as floors after the Reformation. If you’re still in the Council Square, go take a quick look at The Mureșenilor House. The place used to be the editorial room of the Gazeta Transilvaniei newspaper published in 1838 and now functions as the Mureșenilor memorial house since 1968. Moving on and we get to The Ecaterina Gate, one of the oldest gates in town but undeniably the most beautiful is still preserved in its original state. For centuries it used to be the only gate that permitted access on the northern part of the fortress. The four corner towers surrounding the tower of the rectangular construction marked the judicial right of the town. Right next to Ecaterina Gate you will find The Schei Gate. It was built in between 1827 and 1828 in order to let through heightened traffic. The stone and brick gate built in classical style like a triumphal arch has three openings. The middle arch, shaped for traffic, is larger, and on its both sides there are two smaller and lower openings for pedestrians. The Latin inscriptions on the wall above the small arches let us know the construction date, but they also inform us that the gate was built after the Emperor of Austria Francis I visited Braşov in 1817. Heading down the street from the Schei Gate, you will get to The Neolog Synagogue. Built between the years 1899 – 1901, the church is built in the Maure style, with Gothic, Neo-gothic and Roman influences. A bit up the street and you get to The Rope Street. It is the narrowest street in the city of Braşov. It is believed to be one of the narrowest streets in Europe. It was initially built as a corridor that firemen could use, and it is first mentioned in 17th century documents. Strada Sforii is now a tourist attraction and meeting spot. Its width varies between 111 and 135 centimeters, and it is 80 meters long. Now let’s take the city fortifications in a row. If we go on the Tiberiu Brediceanu Aleey, we find an important part of the former Brașov fortification wall. Starting with The Weavers’ Bastion. With a surface of 1616 square meters, The Weavers’ Bastion is unique in Europe. It was first built in 1421 and is now a museum. Going a bit right and we have The Arts Tower. It was designated for storing powder, it now host different art exhibitions. To it’s right, The Rope Makers’ Bastion. Right again and we get to The Hunters’ Tower. Right again, down the street to The Carpenter’s Tower. Used for storing powder, it now hosts the wood carving workshop of the artist Ioan Croitor – Bradescu. To its right, we find The Drapers Bastion. And finally, at the end of the street, we find The Furriers’ Bastion. (which we didn’t catch very well in the photo). Moving on the other side of the city center, on the Dupa Ziduri Street, we find the other part of the old city fortification. Starting from the west, we have The Blacksmiths’ Bastion. Next, a bit up on the hill, we find The Black Tower. To its right, The White Tower. And down below, The Graft Bastion. These would be the remaining of the city fortifications, which, I have to admit, are in a very good shape. Most of them have been renovated and they look very good. even the surrounding area looks very clean and nice, with parks and forests. For a complete Brașov experience it’s a must to go up the Tampa Mountain, from where you will have a perfect view over the entire city. You take a cable car from the Tiberiu Brediceanu Aleey for only 13 lei return. It is functional daily, except Mondays. There is also a hiking trail that can get you up the mountain, but that, of course, will take longer. While still in the city center, also talk a walk around some other absolutely beautiful buildings, starting with The Justice Palace. The Orthodox Church in The Council Square. And The Hirscher House which now hosts a restaurant. After checking the city center in detail, we still have two more places we had to visit. First, The Brașov Citadel, which we also saw from up the Tampa Mountain and had this great view. The Citadel is part of Brașov’s outer fortification system. At first some wooden protective walls was erected here, later, in 1529, destroyed by Petru Rareș. On the same spot they built a stone citadel called Cetatuia (1553), destroyed by fire in 1618 and re-built in 1625. For protective purposes the inhabitants added to the initial building four massive stone bastions in 1630. The citadel was abandoned later, after technological innovations made cannons stronger than the building. It served as a prison for a while. Nowadays the citadel was turned into a restaurant called Cetate. If you visit the restaurant remember to take a tour and admire the collection of Medieval weapons hanged on the walls and to drop a penny in the well (81 m deep) for good luck. In the center of the Citadel is a narrow courtyard displaying shields, lances, a canon and coat of arms. Our final stop for the day was The Saint Bartholomew Church (Biserica Sfantul Bartholomeu), located in the Old Braşov (Braşovul vechi) and being the oldest church of Gothic architecture (1241). The church is a true architectural masterpiece; a mix of the Byzantine, Baroque and Gothic styles. 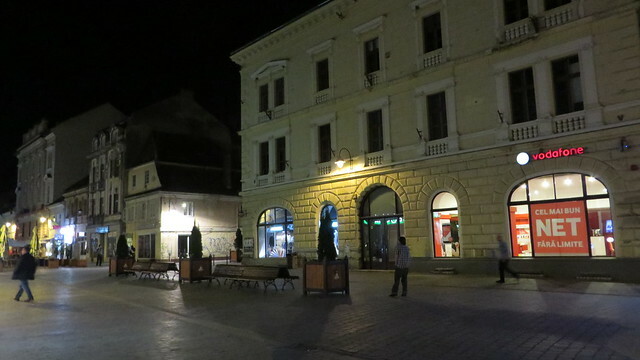 If you have the time and stay in Brasov for more days, have a nice walk during the night. The city looks as beautiful as it does during day time. Brașov, known as Kronstadt in German or Brassó in Hungarian has a population of 283,901 and is the 7th largest city in Romania. It is located almost in the centre of the country and surrounded by the Carpathian Mountains. The city provides a mix of wonderful mountain scenery in the nearby Poiana Braşov and medieval history with German influences in the old town. The city is 176 km from Bucharest. As a conclusion, Brasov looks much better than expected. Most probably that it has changed a lot during the last years, most of the streets and buildings have been renovated and there are still areas where renovations are ongoing. I enjoyed the time here, everything looked very elegant and clean. Including the restaurants and bars, they are all very fancy, with an attention to details, to decorations and architecture. If you’re looking for a nice place to eat, try Bistro De L’Arte – they cook with fresh and local ingredients and it’s the most tasty food in town.